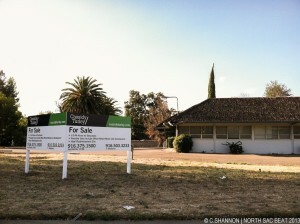 The site which formerly housed the Arcade Hospital at Del Paso Blvd and Arcade Blvd. is up for sale. The 3.4 acre site, which has also housed a school and daycare, has been abandoned in recent years. The main structure at the site (e.g. the hospital) was built in 1963. It is a two-story structure located further away from the street. Sacramento County last assessed the site’s value at $1.6 million; land value at $648,399, and improvement value at $972,510 (as of July 1, 2013). Ironically, the site is still zoned for hospital use. Cassidy Turley is handling the sale, indicating potential office/retail/mixed use development as possible uses for the site. They say it’s an “ideal redevelopment site”. August 11, 2013 in Arcade Hospital, Development, Hagginwood.